Our Market Meal Kits are quick, easy and delicious! Sometimes the “easy way out” is the most delectable! Our Market Meal Kits are savory, all-in-one meal solutions for two, ready in 15 minutes or less. Each kit features quality ingredients from our store—like boneless, skinless chicken breasts, succulent shrimp, sirloin beef steaks, Atlantic salmon fillets and fresh veggies—so you can feel good about what you’re cooking. We’ve done the prepping, planning and packing for you: all you have to do is pick what you like, follow our step-by-step instructions and clean your plate (without washing too many dishes). 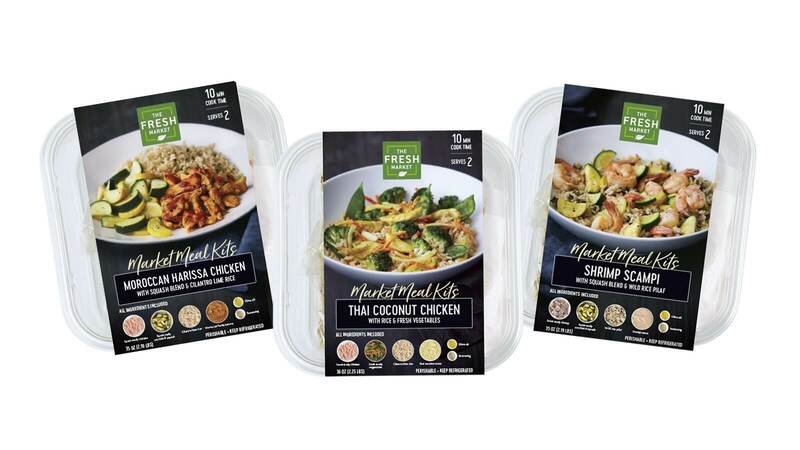 Find our Market Meal Kits in stores now, along our chilled produce wall. Keep scrolling for descriptions of each recipe, plus wine recommendations to round out your meal. Selection varies by store location, but you should always find at least five options to choose from. Don’t see your favorite meal? Ask your store manager to include it on the menu for your next visit! 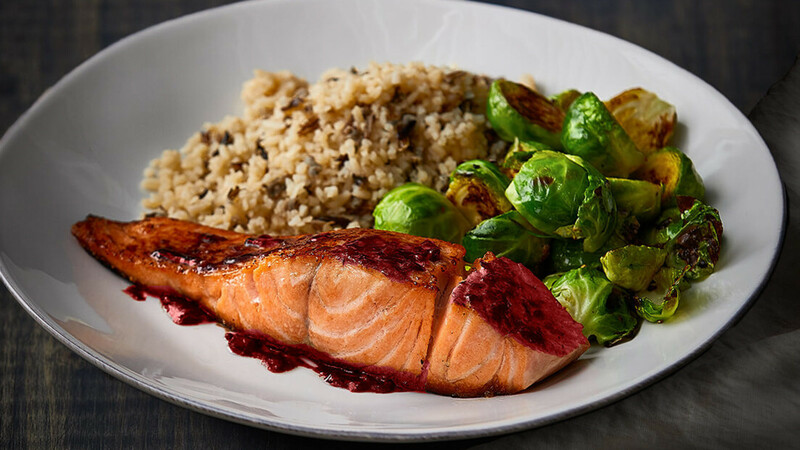 Our salmon fillets are fresh, tender, easy to cook and delicious with sweet and savory cherry port sauce. This meal is ready in just 20 minutes! Simply pan-sear your salmon in sauce made with Port wine reduction, roasted garlic, dark sweet cherries and the perfect blend of spices. We’ve included fresh Brussels sprouts from our Produce Department you can sauté, steam and serve—oil and seasoning included. Add ready-to-heat rice pilaf and you’re finished! 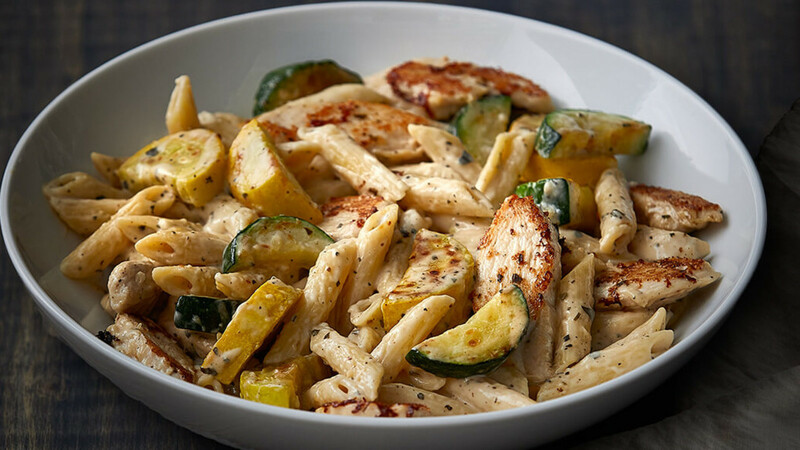 Tender chicken breast strips, perfectly al dente penne pasta, rich Parmesan sauce—what’s not to love? Enjoy a flavorful pasta dinner for two in just 15 minutes. Pan-sear our chicken breast strips and add a side of sauté-ready zucchini and yellow squash from our Produce Department. The pasta is cooked, so all you have to do is toss it in the pan for a few minutes before serving. A creamy sauce made with Parmesan cheese, aromatic basil and garlic adds flavor to every bite. 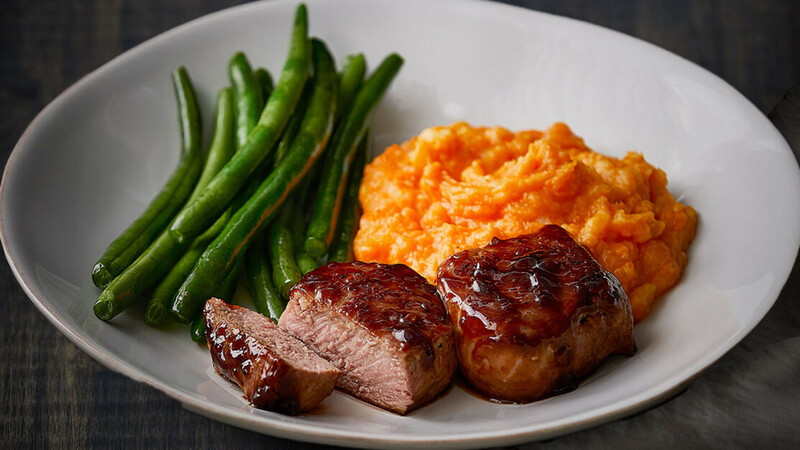 Our boneless pork tenderloin medallions make an impressive entrée. Simmer them in a rich sauce made with aged balsamic, sweet honey, fragrant rosemary and savory garlic for a memorable meal that takes 20 minutes or less to cook and serve. Round out your meal for two with fresh green beans from our Produce Department, ready to sauté and steam, plus ready-to-heat mashed sweet potatoes. Who doesn’t love a good one-skillet meal? This delicious recipe takes 15 minutes and is practically foolproof. 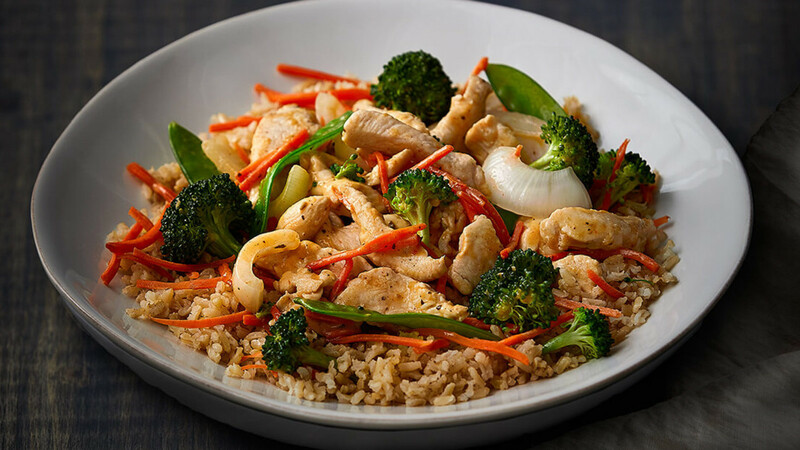 Sauté our tender, organic chicken breast strips with fresh broccoli, carrots, onions and snap peas from our Produce Department. Pull it all together with a vibrant sauce made with lemongrass, bright lemon zest, coconut milk, basil and garlic. Serve over ready-to-heat brown rice, and you’re ready to feast. Like your favorite takeout, but better. 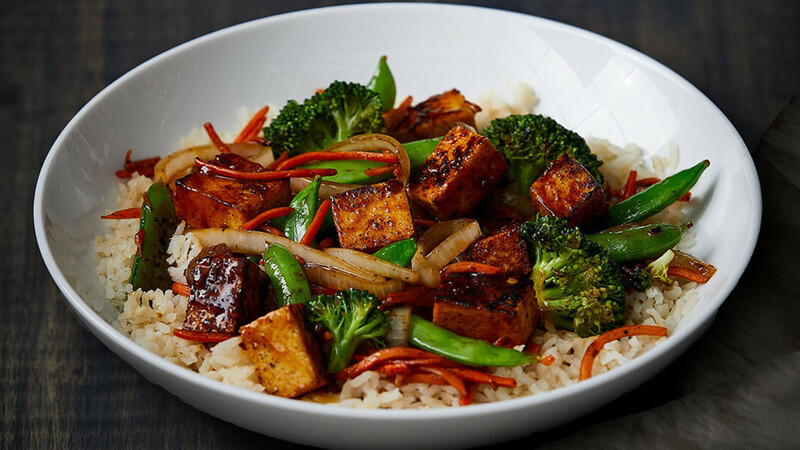 This vegetarian-meal includes extra-firm tofu, along with fresh carrot shreds, sugar snap peas, broccoli florets and white onion from our Produce Department. These veggies are ready to sauté along with our pre-cubed tofu. Classic General Tso’s sauce adds savory-sweet flavor, while white rice fills out the meal (and soaks up the delicious sauce). The entire dish is ready to eat in 10 minutes or less! This Italian-inspired meal is quick to cook and oh-so satisfying for vegetarians and carnivores alike. First, sauté fresh vegetables from our Produce Department, including yellow squash, zucchini, red peppers, broccoli florets and white onion. They’re prepped in-store, so there’s no need for knives. 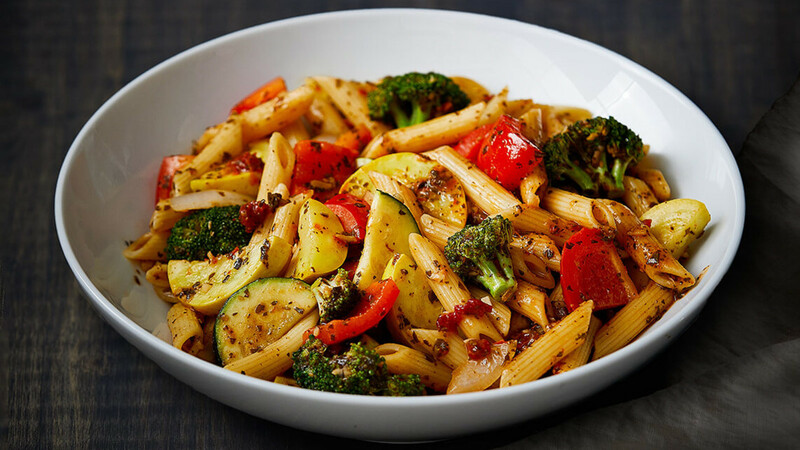 The pasta itself only requires a quick simmer with our sun dried tomato pesto. Grab two bowls, and you’re ready to eat in just 10 minutes! We recommend pairing with: David Bruce Russian River Chardonnay. 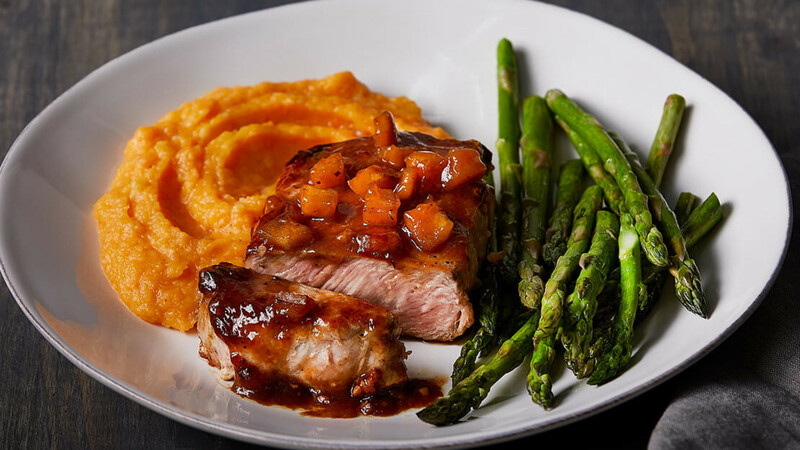 Treat yourself (and someone special) to our rich and flavorful Brandy Apple Glazed Pork Chops. This meal is ready to cook and serve in 15 minutes or less. Start with fresh asparagus that’s simple to season, sauté and steam to perfection. Complement our thin-cut, pan-seared pork loin chops with mouthwatering brandy apple sauce, then round out the meal with mashed sweet potatoes—no peeling or prep work required. We recommend pairing with: St Francis Cabernet Sauvignon. This dinner for two is ready to cook in 15 minutes or less, and tastes as delicious as what you’d find in a restaurant. Our tender, juicy top sirloin steaks are ready to pan-sear. Add a side of fresh asparagus for color and crunch, along with homestyle mashed potatoes made with real butter and cream. We’ve even included portabella cabernet sauce made with mushrooms, rich red wine and the perfect blend of spices. It tastes homemade, and pairs perfectly with our steak! We recommend pairing with: Decoy Rosé. 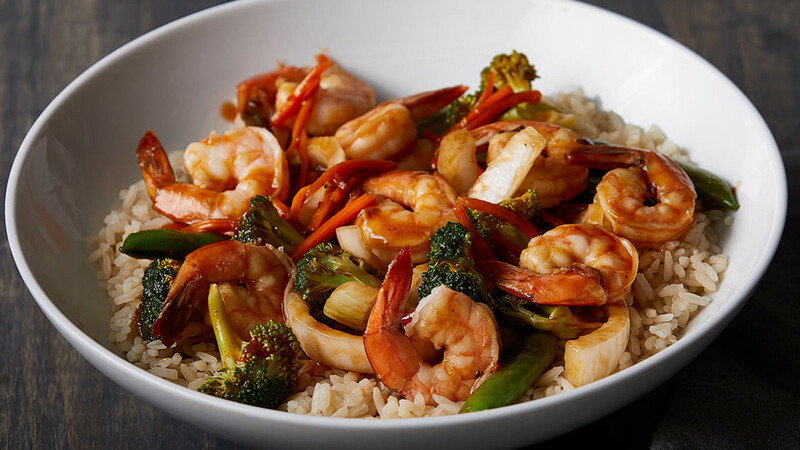 Spice up your lunch or dinner with our Szechuan Shrimp Stir Fry, ready to savor in 15 minutes or less. Our peeled and deveined shrimp are equal parts delicious and convenient. Once you’ve sautéed the fresh broccoli, carrots, onions and snap peas, cook the shrimp in a matter of minutes. Add our spicy, savory Asian-inspired Szechuan sauce, flavorfully balanced with soy sauce and sherry wine. Finish off your plate with a healthy heaping of white rice, and enjoy! Our Southwest Chipotle Chicken is rich and satisfying, ready to serve in just 15 minutes. Kick up our all-natural, hand-trimmed chicken breast with zesty Southwestern sauce made with cream, tomatoes, poblano chilies , garlic, cilantro and spices. 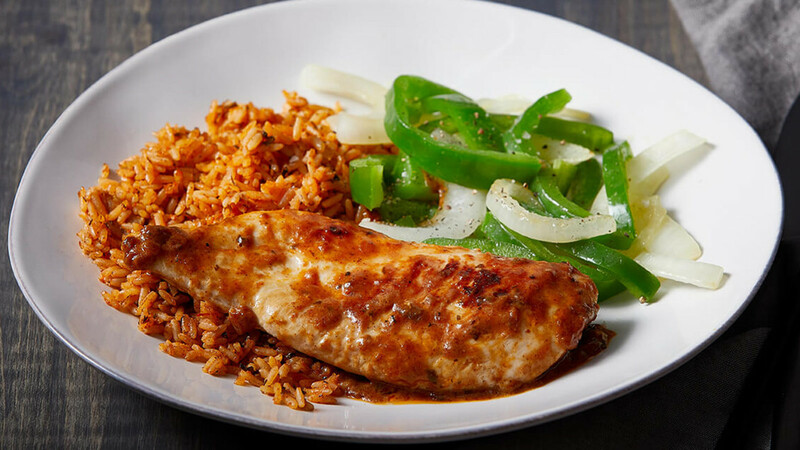 Once the chicken has simmered and soaked up all the delicious flavors, add a side of sautéed bell peppers and onions—plus Spanish rice made with chilies, herbs, spices and bright lemon zest. If you’re craving big, beefy flavor, you’re in luck. 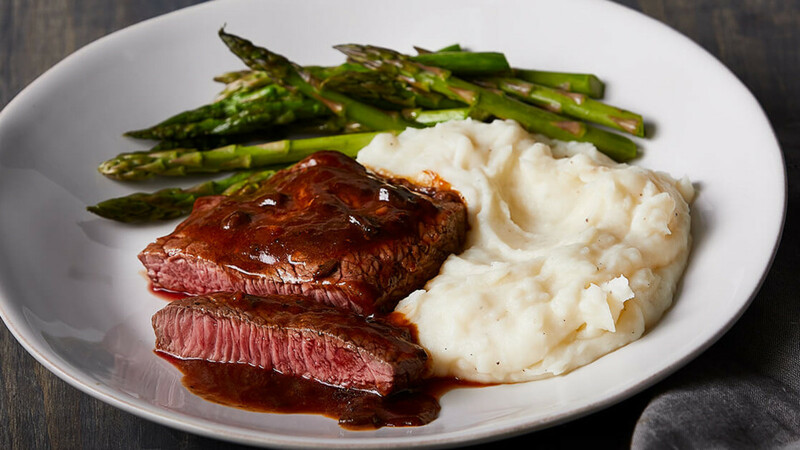 Our Premium Choice Sirloin Strips are tender, juicy and sauté-ready. Enhance every bite with ready-made Korean BBQ sauce. Brown sugar, soy sauce, garlic, herbs and spices combine to create sweet and savory flavor. 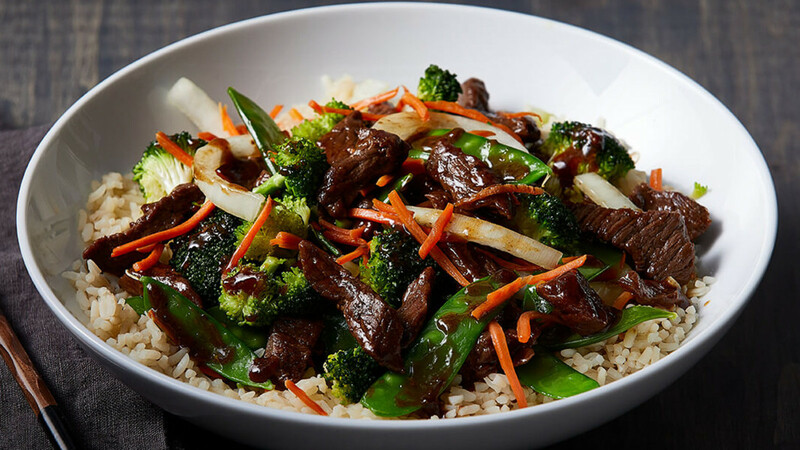 Round out the meal with stir-fried broccoli, carrots, onion and snap peas, fresh from our stores. The best part? It’s all ready in 15 minutes or less. This meal is nourishing, flavorful and ready in 15 minutes. Our Atlantic Salmon Fillets are tender, mild, flaky and delicious and lend themselves well to bold flavors. We’ve paired them with ginger sauce made with garlic, ginger, soy sauce and spices. 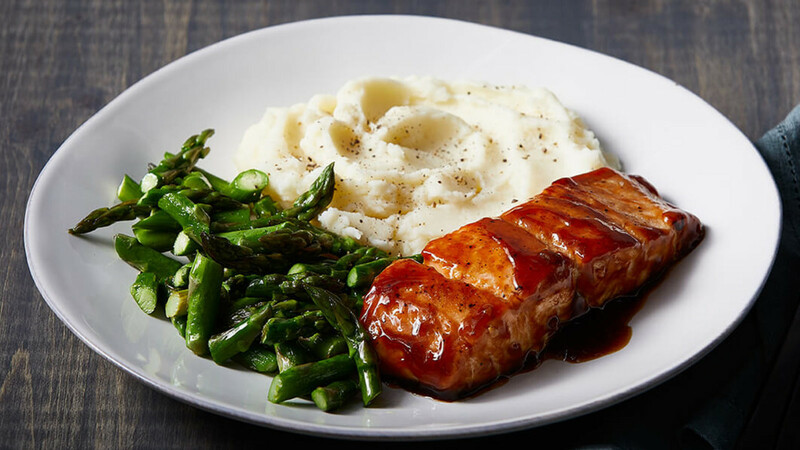 Simply pan-sear your fish and complete the meal with fresh asparagus from our stores, plus creamy mashed potatoes blended with real butter and sour cream. This Italian-American dish is fresh, flavorful and ready to enjoy in just 10 minutes. 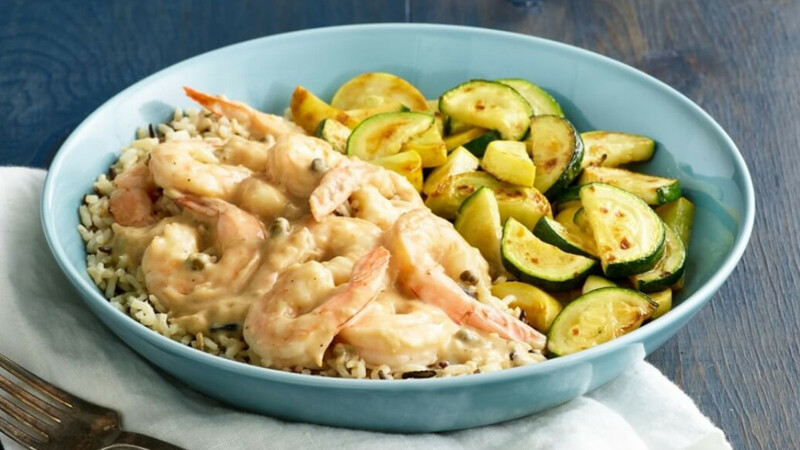 Garlic, lemon zest and tangy capers meld with white wine, butter and cream to create a traditional scampi sauce—perfect for our tender, succulent shrimp. We’ve peeled and deveined these easy-to-cook shellfish for even more time-saving convenience. Add fresh, pre-cut zucchini and yellow squash from The Fresh Market and perfectly-seasoned Wild Rice Pilaf for a healthy and satisfying meal. Ready in 10 minutes or less, this dish is just as quick as take-out and includes top-notch ingredients from The Fresh Market. Our boneless, skinless chicken breast is hand-trimmed and antibiotic-free for a tender texture and natural flavor. 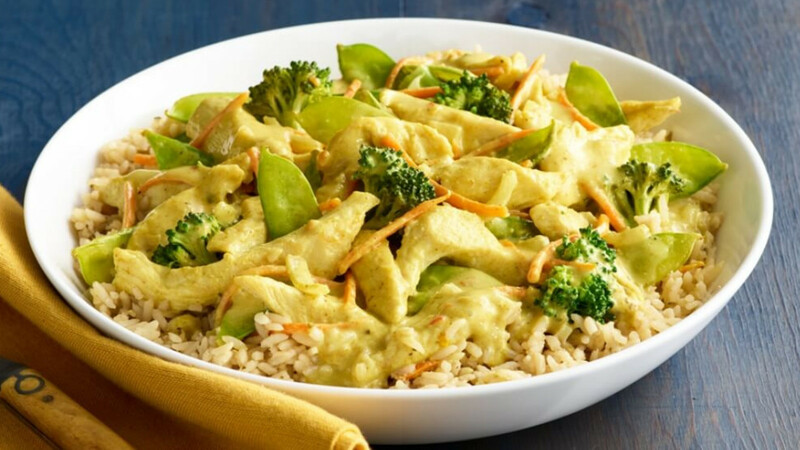 Simmer in a savory Thai sauce made with rich coconut milk, garlic and flavorful spices like ginger and turmeric. Broccoli, carrots, onions and snap peas from our store complete this meal for two, along with herbaceous Cilantro Lime Rice. 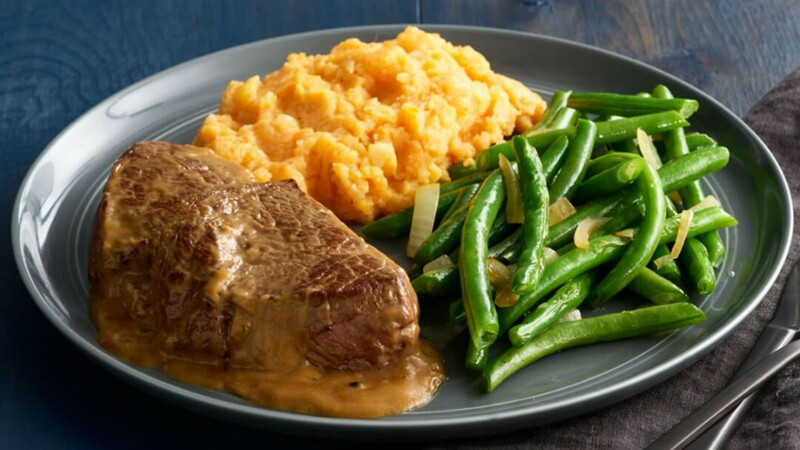 Sweet potatoes, fresh veggies and tender, savory sirloin beef steaks slathered in rich bourbon-peppercorn sauce: what’s not to love? These sirloin steaks come straight from The Fresh Market, along with green beans and onions. The bourbon-peppercorn sauce is crafted with bourbon, garlic, Madeira wine and spices for robust flavor that tastes homemade. Crisp veggies and sweet potatoes mashed with butter and brown sugar add the perfect balance of savory and sweet. Best of all? This delicious dinner is fast and foolproof, with a prep time of just 15 minutes. Prepare an Italian-American classic in 15 minutes or less! 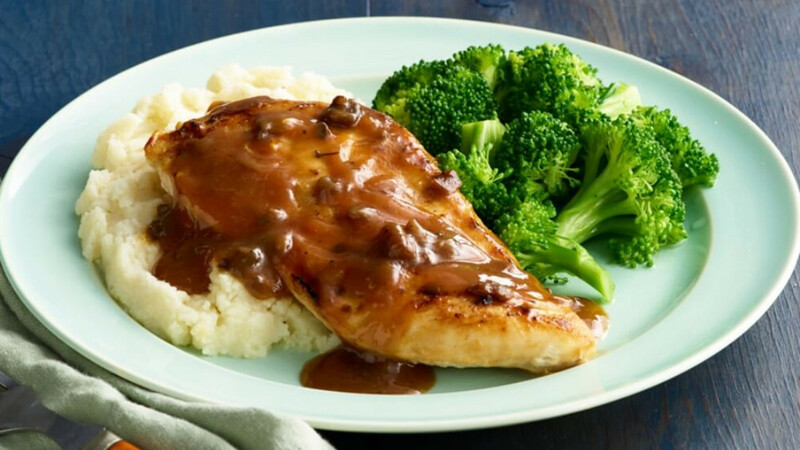 The Fresh Market boneless, skinless chicken breasts make for a tender, top-notch main course. The delectable Marsala sauce is pre-made with Marsala wine, mushrooms, onion, garlic and spices for full-bodied flavor. We’ve also included homestyle mashed potatoes blended with butter, sour cream, salt and pepper, as well as fresh broccoli from our store. The only thing left to bring to the table is your appetite!